If sports heroes are any indication, aging can happen two ways. V1: Forty years after his 12-season run, Joe Namath walked onto the field and flipped the coin at the Super Bowl, waved to the crowd, cashed the check, then went home to shower off the weight of former glory. V2: After chasing Ali for 20 years, George Foreman punched his way to the World Heavyweight belt at age 45. Unbelievable, well-earned… and then 10 years later, cornered the market on countertop grills. His career highlights went: Ali, Frasier, Holyfield, sandwiches. Team Wild Card’s return bid for Alaska is somewhere between Ali and sandwich, or at least their version. 1978 had a mixed bag of male role models: Harvey Milk, George Foreman, Jim Jones, and an oddly-timed decision by the Weather Service to name every other hurricane after a dude. Finding no KoolAid flavor to their liking, Team Wild Card found their own drummer to march to, and cast off to Alaska. Their craft was a leaky, wooden Dragon: a sailboat whose long overhangs and low freeboard make it more suited to its natural habitat of the inshore races of mid-century Olympics than, well, Alaska. But they did it, up and back, and unknowingly laid the ground work for what would become the aspirations of the R2AK: go to Alaska, simple and cheap, while humming the BeeGees as much as possible. Forty years before their R2AK bid, Team Wild Card was the bearded 1970s wonderment you see above. The Dragon they sailed on was simply the boat they had—wool sweaters, jean shorts cut above the pockets, harmonicas, crappy champagne, and singing that year’s aspirational, “Staying Alive,” “We Will Rock You,” etc. They had the Nikkon camera, they loved to take the photographs, they were broke and bold in the analog era—actual film, paper charts and sheep-based adventure clothing—they made it fine. Driven to keep driving, in the 40 years between then and now, they’ve stayed George-Foreman-sharp by racing and sailing whenever, whatever, and all over. Regional races on big boats, Oregon offshore, Northern Centuries, and when they weren’t racing, they were filling up their maritime bucket list with cruises to San Francisco, around Vancouver Island, squareriggers through the Great Lakes, Caribbean and Atlantic coasts, and laps around the San Juans on a Boston Whaler. A leaky, wooden boat has a certain appeal when you don’t have a clue or another option, but the older/wiser/new trick part of Team Wild Card’s 2018 program is their boat update: the Santa Cruz 27. Fast, cheap, and purchased recently off of Craigslist, this time their boat has been proven (hasn’t) and tested (hasn’t). 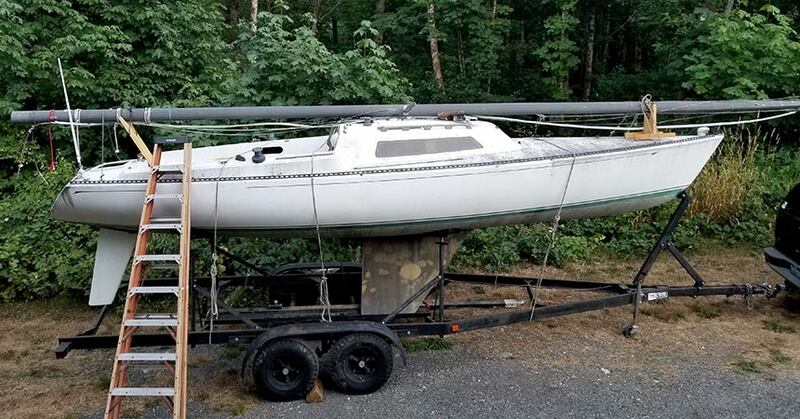 A “modern” everyman racer, the SC27 was also a 1970s phenomenon, designed by low-orbit, California legend Bill Lee to be the fast/fun racer for champagne sailing on a Budweiser budget. Ironically, the last one rolled off the production line in 1978. Welcome to the R2AK, Team Wild Card. May the charm of sleeping on wet sailbags hold up after four decades.